ANN wrote: Mankind has developed superpowers known as "Quirks" with 80% of the population having some kind of superpower. These new abilities see the rise of both superheroes and villains. A prestigious school known as the The Hero Academy trains superpowered hopefuls into the heroes the world needs. Middle school student Izuku Midoriya wants to be a hero more than anything, but he's part the 20% without a Quirk. Unwilling to give up his dream, he plans to take the exam and be accepted into a high school for budding heroes. Through a series of serendipitous events, he catches the eye of the greatest hero, All Might, who agrees to train him. If you are the 1% of the anime population that has not already seen this, it's definitely worth checking out if you are into shonen series. A lot of people see it as one of the next big series to watch after bleach and naruto ended. Bones has done a very good job at adapting it, and the 2nd season is just as good if not better than the first season, and season 2 is a 24 ep dual season series so it's still ongoing next season. yeah, I've just recently caught up on this, and it really lives up to the hype. In ways similar to One Punch Man, It turns a lot of the cliche shonen plots and archetypes on their side. So i think that even people that don't typically like the genre can still appreciate it. Also, I think that this has the best cast of female characters that I've ever seen in a Shonen anime. I'd say it's actually sort of the opposite of one punch man. Whereas one punch man is about a guy who is already the strongest person in the world (or maybe even universe?) but does care about much of anything. And the hero society is basically like modern day bureaucracy where they are all worried about appearances and rankings. 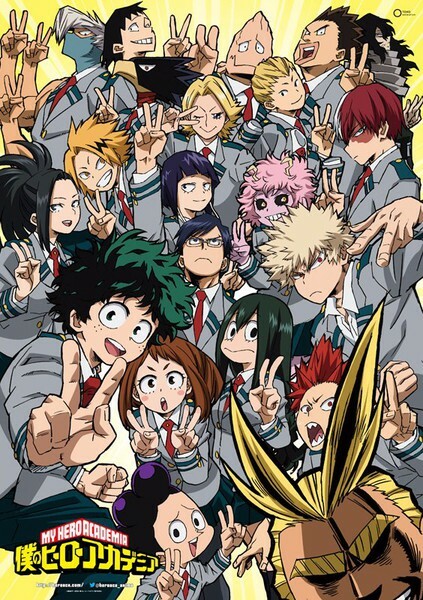 My Hero Academia on the other hand is the more traditional story about the underdog who needs to work his way from the bottom and has a enormous will to succeed, and where the heroes are shown in a much more admirable light, embodying the ideals that people admire (even including those in their exams, like the support points in the entry exam). They're shows of the same topic (superheroes) from nearly opposite points of view. kireblue wrote: Also, I think that this has the best cast of female characters that I've ever seen in a Shonen anime. In addition to this, I love the fact that most of the characters in this series actually have parents. Like, I really don't know how many more of these shows I can do where all the kids are orphans/living alone. I look forward to watching this every week more than I have anything since ever. This series has been good from the start but really got into the zone this season and is just making all these perfect episodes now that I just want to bottle up and inject into my veins. The 2000s had Soul Eater, we have this and this isn't even its final form. The sudden realization that this is going away in two weeks, probably for 6 months but possibly even longer, is really messing with me right now. Someone tell me if I'm wrong here: In 36 episodes, this series has more effectively developed its supporting characters than Naruto/Naruto Shippuden was ever able to do in more than 700 episodes. This week's episode was one of the single most enjoyable episodes of anime that I've ever had the pleasure to watch. Whether or not that makes it one of the "greatest" episodes I've ever seen, I don't know. But my goodness, this show is in such a beautiful rhythm right now. Every aspect of the production, certainly from the writing and directing but also the editing and the music is just working on a level that's above and beyond what any viewer of this kind of anime would ever expect or dare to ask for. No small amount of this is going right over most viewers' heads...and that's okay, whatever, it's still working even if most viewers don't even register it. There was no resolution of a great conflict, no big reveal or dramatic scene or unexpected development. Just like the previous episode, it was more vignettes of the characters paired up to take their practical exams. There's no shortage of tension in these due to the test itself, but these are used as opportunities to show the true nature of the characters in action. This is, I guess, not necessarily telling us how the characters are feeling or what their motivations are -- per Naruto, 90% of this was done through flashbacks -- but showing us how they react under pressure in the current moment. Yeah, everyone uses their unique quirks to solve problems, but their quirks are secondary to their personalities and their ability to communicate, strategize, sacrifice themselves and empathize with one another. I love the positive energy in this series, how the characters genuinely like each other and encourage each other to grow and become stronger. This is a well-worn trope, I know, but here it's more sincere and believable than I've ever seen before. I'd love to eventually have something interesting to say about this and I guess soon I'll have nothing but time to think about it, so I hope this isn't the end of my thoughts on this series. I really could go on and on, maybe even into specifics of how this show works as well as it does, but that deserves a fresh new post and more time to devote to it than this. Does Momo always wear a shelf (?) and I just never noticed it? The first 2 episodes were...not that good? Felt like they were trying really hard to bring new viewers up to speed while not really doing anything with the story. I mean, I get it. It's just not what I need or want right now. The whole premise of the beginning of this season is basically the same as the Fairy Tail arc that made me lose interest in that series and ultimately just drop it for good. That said, I am still enjoying this and do absolutely prefer it to that other series in every way. Just feels like, for the first time, this show is really going into been-there, done-that territory. And yes, I know it had a tournament arc. So I don't know if it's real faith or just hope, but I do believe this is going to get back on track really soon. The most recent episode I've watched is bringing things back in the right direction, imho. It's possible that everyone else reading this has no idea what I'm complaining about and is completely loving every episode of this. In fact, I hope that's the case and it's just me. I kinda agree 3rd season set diffrent pacing and feel. Buut mby it's not bad for some 'heat up' again.